I knew it was coming, but I was still so happy to see the package from Nancy in my mailbox. Expecting only a laminated registration paper, I was excited to find a beautiful horse calender and a handwritten three page letter along with Willow's pedigree. 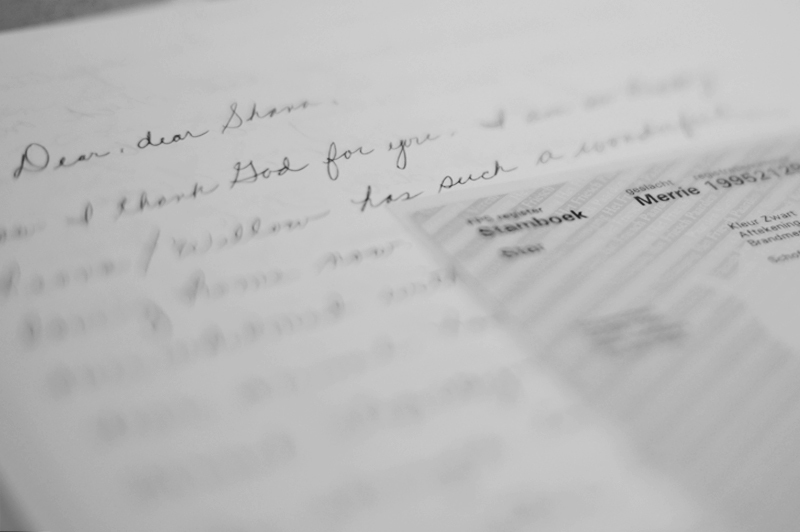 I cried as I read her heartfelt words..."Dear, dear Shana... How I think God for you. I am so happy Leona / Willow has such a wonderful loving home now....." She went on to explain how she is "so overwhelmed with grief at that this dear animal has had to endure" that she cannot stop crying and can't bear to even look at my blog... Her daughter will be keeping up on the blog until Willow looks much better so Nancy can endure seeing her photos. Even more proof that Willow was loved very much for at least 10 years of her life. Aside from the past three months when she being cared for by Leah, the 4 years before that are a mystery. And honestly, I don't think I even want to know what happened to her and exactly how long she was left with a heard of other horses, starving and wasting away... it really is heart breaking to imagine. Awww Tami... thank you so much! So glad she shares a birthday with someone so sweet... April 20th is also the day we received our referral of our daughter from china!! My name is Maud and I am from the Netherlands. I follow you for a while on flickr and Facebook and I like your photos a lot! If you want I can translate the pedigree for you. My brothers birthday is also on April 20th. I read the blogs with pleasure! Let me know if you want that I translate for you. I do it gladly!